We have tried to make the web site as easy to use as possible but we often get emails asking us questions so here's the answers to some we get asked fairly frequently. Where is the email I was expecting from you? This occasionally happens and the first thing to do is check your "Spam" folder and make sure it's not ended up in there. See also I've not had the registration email I was expecting from you below. Why haven't you replied to my email yet? We're only a two person business and sometimes we don't have Internet access, for example if we're out of the fells, but rest assured that we will get back to you as soon as we possibly can. Where's the walk PDF/GPX I've just purchased? Normally, when you purchase a walk PDF or GPX then PayPal tell us that you've paid pretty much instantly and we then add it to your rucksack and also email you about it. So if you've not received the email then see I've not had the email I was expecting from you above but in any case you can just go straight to your rucksack and you should find it there. If you don't then it's possible that PayPal is taking its time in telling us that you've paid so go and make yourself the hot beverage of your choice and then look in your rucksack again. If it's still not there in fifteen minutes or so then contact us and we will sort it out. Rest assured that you will get your PDF or GPX. I can't open the PDF I've purchased. Can you help? It's always difficult to give specific advice as we don't know what device you have and what software you have for opening PDFs. Certainly on our tablets and phones, which use Android, we have the Adobe Acrobat Reader software installed (which is free), and when you click on one of the links in the email we send you the device offers to open it using that software. The same software to open PDFs is also available for iPhones and iPads. Some people find that they can't open the PDF from the link in the email, especially if they are behind a company firewall. If this happens then try going to your rucksack (to which there is a link at the top of every page if you're logged in), selecting the Your purchases option, and then clicking on the appropriate link in there. I can't open the GPX file I've purchased. Can you help? If you want to put it on your GPS then see How do I get the GPX file onto my GPS? below. If you're trying to open it on your PC or laptop and don't have any suitable software available then our GPS mapping app can help. Save the GPX file to your hard drive, then go to the app, click on the menu button, and select "Load GPX file". If you're trying to open it on your phone or tablet then you need some appropriate software. If you don't already have something installed then we normally recommend ViewRanger which is free to download for Android and iOS. Once that is installed then, when you download the GPX file from our site, your phone or tablet should automatically offer to open it in ViewRanger1. The GPX I've just purchased says the walk is shorter than your instructions. Why? What you've purchased is a GPX route, so that's a set of waypoints which you walk from one to the next to complete the walk. Each waypoint is some distance from the previous one. That's normal, you don't want too many waypoints on a route: they're there to guide you forwards not log every minor twist and turn. However when we work out the walk distance we rely on the GPX track we recorded with our GPS while walking the route. That accurately records where we walked as it logs many more points. The consequence of this is that a track accurately reports distance whereas a route is always going to be shorter as it (quite literally) cuts corners. Anyway, the bottom line is: rely on our walk instructions for distance and the route GPX for waypoint to waypoint directions. I don't want to create a PayPal account to purchase something from you? That's not a problem. 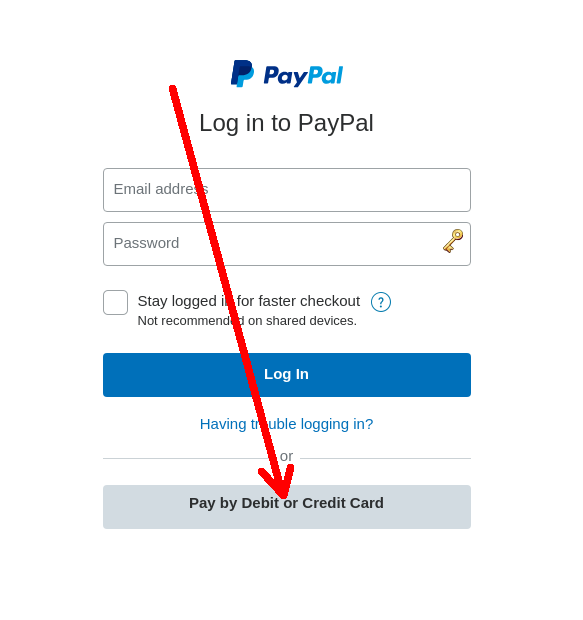 Although PayPal are our card processor you should be able to check out using your credit or debit card without creating a PayPal account by selecting the "Pay by Debit or Credit Card" option (see this screen shot for its location). If you're not seeing that option then it should, hopefully, appear if you re-load the page but please do let us know if it doesn't so we can tell PayPal. If you don't then you must have mis-typed your email address the first time then either continue and register again with the correct email address and another username or contact us so we can reset the account. Can you tell me my username? Yes, if you enter the email address you used to register in this box and then click the button our server can find your username and mail it to you. No, sorry, passwords are stored using a one way encryption technique for security purposes. What you need to do is go to the login page and select the I forgot my password link. On the next screen enter your username and email address and a link to reset the password will then be sent to your email address. Once you are logged in you can then change your password in Edit account settings under the "Profile" tab in the "User Control Panel" in the forum. Once you are logged in you can then change your email address using Edit account settings under the "Profile" tab the "User Control Panel" in the forum. What are these XX999999 format coordinates all about? Visitors from abroad are sometimes a bit bemused that we specify map coordinates in XX999999 format rather than latitude and longitude. This is because the commonly use walking maps, both Ordnance Survey and Harveys, use a grid based on the OSGB36 datum, and not WGS84. We have a page explaining how to use the OSGB grid. I'm a supporter have a new credit card - how do I update how I pay you? Click on the "Wallet" link which you will find in the blue bar across the top of the page. Click on the old card and, on the next page, click "Edit card details" to update the expiry date and CSC. Click on "+ Add a card" and add your new card. Now click on the settings cog wheel image which is displayed top right and on the next page click on "PAYMENTS". Click on "Manage Pre-approved Payments" and you will see a list of your pre-approved payments including one to WalkLakes. Click on "WalkLakes" and under "Funding Source" replace your old card with your new card. GPX files work with a GPS, either a dedicated device or the GPS hardware in your mobile device (if you have the right software installed). a GPX file is not a map however if your GPS has mapping on it then the route should appear overlaid on the map. Remember that this is a route (where you are intending to go), not a track (where you have been) so don't try to load it on your GPS as a track. Will my GPS understand your GPX file using the UK grid? Although we use the OSGB grid in our text descriptions all GPX files, including ours, use latitude and longitude on the WGS84 datum so our GPX file will work with your GPS, wherever in the world you are from. Will my GPS work with OSGB grid references? Yes, most modern GPSs know about all the world's most commonly used grid systems, including ours. You just need to delve around in the settings. How do I get the GPX file onto my GPS? We can't offer advice on specific GPSs - you need to talk to whoever you bought the GPS from or look on the Web. Some brands have wikis or forums, either supported by the manufacturers or users. For example Garmin have an active forum where Garmin staff are ready to help. However if you don't have the software for the GPS or if, like us, you don't use Windows, you might find the GPSBabel software useful. It runs on Microsoft Windows but also POSIX OSes such as Mac OS/X and Linux and can convert waypoints, tracks, and routes between popular GPS receivers such as Garmin or Magellan and mapping programs like Google Earth or Basecamp. We use it with our Garmin GPSs. Do your walks follow paths? Typically yes. We don't normally send people off yomping across the fells without a path to guide them. If for some reason you need to stray off the path we give very clear instructions to help you find your way. Note that currently this doesn't work using the Firefox browser on Android, but it does if you use the default Chrome browser.